West Nile virus is a mosquito-borne virus that can cause encephalitis (inflammation of the brain) or meningitis (inflammation of the lining of the brain and spinal cord). Outbreaks of the West Nile virus have occurred before in Egypt, Asia, Israel, South Africa, and in some parts of Europe. 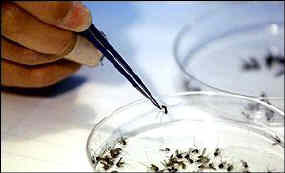 West Nile virus was first found in the United States in New York City in the fall of 1999. During that outbreak, 61 people, including 46 residents of New York City, became ill. Seven people died of West Nile virus-related infections during this initial outbreak. While we are uncertain how West Nile virus arrived in the USA, the most likely explanation is that the virus was introduced by an infected bird that was imported or an infected human returning from a country where the virus is common, or a mosquito hitchhiking on an airplane. 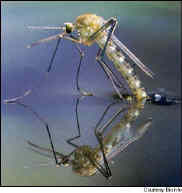 West Nile virus is spread to humans by the bite of an infected mosquito. When a mosquito bites a bird that carries the virus, the mosquito becomes infected. It is believed that people cannot get West Nile virus directly from another person, or animal, that has the disease. It is believed that this disease is only transmitted by mosquitoes.